Nos últimos tempos temos tido imensas novidades boas aqui para o blog :) E o post de hoje é sobre uma delas: a parceria do MKJ com a HoodBoyz (aqui), que é uma loja online alemã com um conceito urbano e orientada para street, skate e hip hop wear. Vende desde vestuário a calçado e acessórios (para mulher, homem e criança), das mais variadas marcas, como Nike, Timberland, Adidas, D&G, Pepe Jeans, entre muitas outras. Acabei por escolher esta carteira (gira que só ela) da Adidas e mais duas pecinhas que verão noutros posts :) (posso já adiantar que fiquei felicíssima com todas). A Sónia é super simpática e fez questão de frisar diversas vezes que eu estava completamente à vontade com o post e o seu conteúdo (não aceitava se fosse de outra forma, mas gostei da atitude :) ). A encomenda demorou cerca de uma semana e meia a chegar. O único aspeto menos bom que aponto é que algumas fotografias deles podiam parecer um bocadinho mais profissionais (mas podem até ser cedidas pelas marcas e não serem da autoria da HoodBoyz). De qualquer das formas, é apenas um pequeno pormenor. Considero esta uma das melhores parcerias do blog, em todos os aspetos :) Obrigada HoodBoyz. The last few weeks have been full of great news for MKJ :) And today's post is about one of them: the partnership between MKJ and HoodBoyz (here), which is an online german store, with an urban concept, and focused on street, skate and hip hop wear. It sells from clothing, to shoes and accessories (to women, men and children) from a big range of brands like Nike, Timberland, Adidas, D&G, Pepe Jeans, and so many others. When Sónia from HoodBoyz reached me and told the store's concept, I thought that maybe I wouldn't find anything that suited me (you know me, skate and hip hop wear is not really me, right?). But I was wrong. So many stuff that I loved. I ended up choosing this (amazing!) 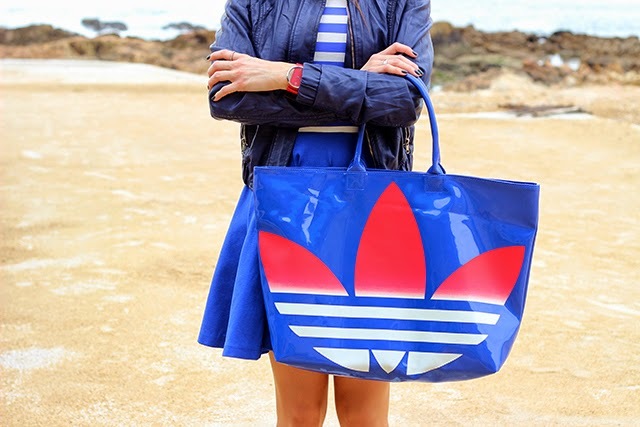 Adidas bag and two other pieces that you'll see in other posts (but I can tell you right now that I was really happy with them :D). Sónia is really nice and she really wanted to make sure that I knew that the posts and their content were totally up to me (I wouldn't accept it, otherwise, but the attitude was nice :) ). The package took about a week and a half to arrive. The only not so good aspect that I can point is that some of the pictures of their products could look a little more professional (but maybe they belong to the brands and not to HoodBoyz). And that's just a small detail. Wow! I totally love your outfit! You look so cool! You really got some nice pieces and styled them amazingly :)! You go, girl :)! 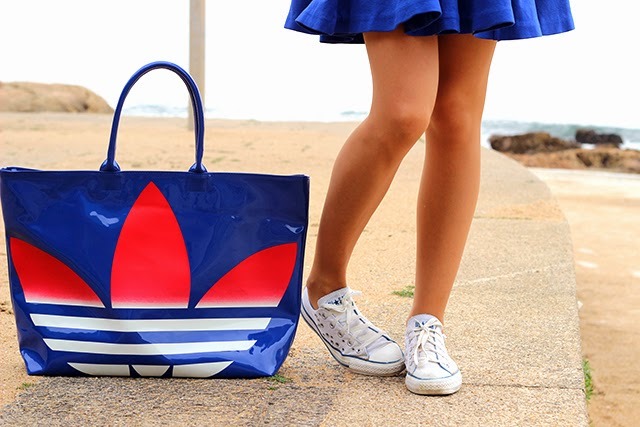 What cool bag and dress! Barbara, you look really pretty in blue, the nuance is perfect for you! WOW!! super combined and spectacular big bag!!! I really like this outfit dear!!! 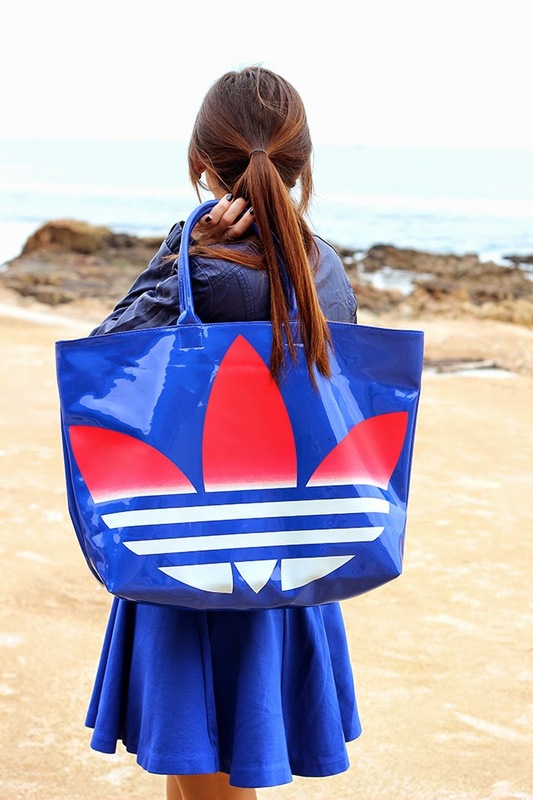 Cute beach bag! That will definitely fit anything your heart desires! Amei! O vestido é lindo também! 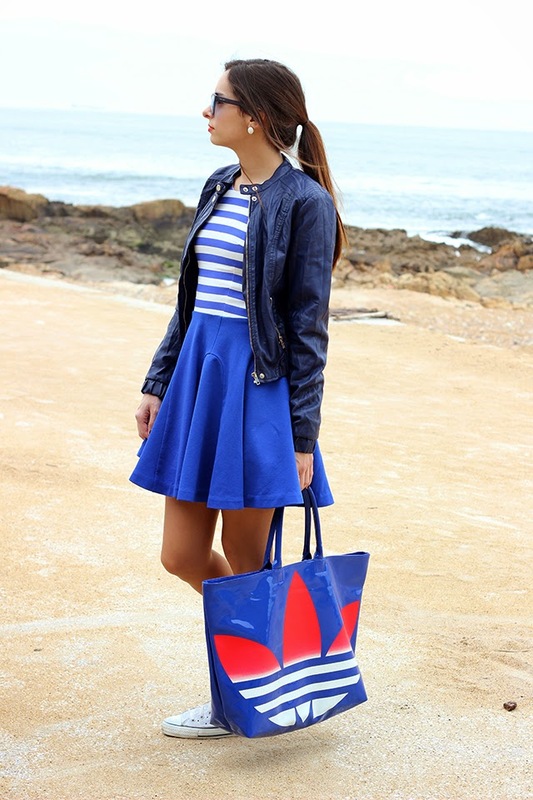 love the blue skirt n bag!! beautiful sea behind!! the collab is a great news!! 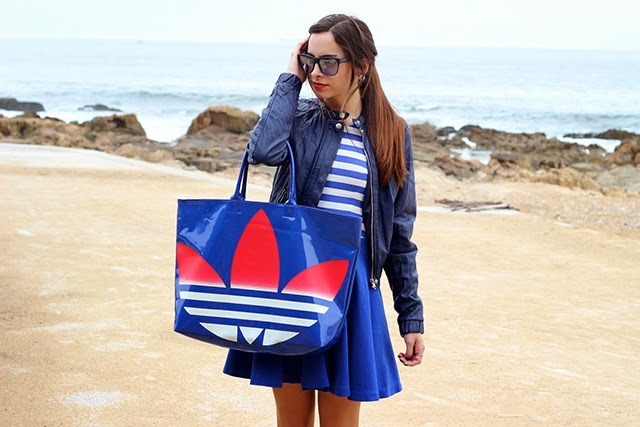 Gostei muito deste look mais desportivo! WOWWWWWWW!!!!!! Que súper lokk neni!!!! Te queda genial y esk me encanta por todos lados!!! !